I love Thanksgiving. It’s a relatively stress free holiday—no gifts to fret over, no required ornaments or decorations, the weather’s usually pretty okay and, if I’m really lucky, and not hosting the feast, there’s The Macy’s Thanksgiving Day Parade. Macy’s is a magical place and it’s image—at least in my mind—is fortified by the parade. It’s on my bucket list. At some point in my life, I will view the entire spectacle from the window of a hotel on the parade route. Afterwards, we, my husband and I, will stroll the streets of the Big Apple, ogling Christmas windows on Fifth Avenue, smiling and chatting about the floats and balloons along with the millions of others who have come to town for the very same reason. Ah, bliss! It may be cheesy but, it’s my idea of a great time. Apparently, I’m not alone. I have a feeling that there’s a secret army of Macy’s Parade aficionados with Shana Corey being among them. How else could she have written such a charming story about the parade? As she readily admits in her note at the end of the book, she’s taken some license with the actual facts. However, the emotion is right. The story features little Milly, a new immigrant, feeling the plight of so many other immigrants who were missing the people and traditions they had left in their homelands. Her father and his friends, workers at Macy’s, are blue. America is not yet home. Things here are different. The holidays will not be the same. Enter Milly with a big heart and a quick, inquisitive mind. Why mope about what is in the past? Why not bring the old customs to New York? Stroll and sing, wear costumes and be festive but in a new way, an American way. Why not have a parade? Milly thought it was a good idea. Mr. Macy thought it was inspired. A parade would capture the attention of all New Yorkers from the Rockefellers to Broadway chorus girls. And so, according to Ms. Corey, a new tradition was born. Even if it’s not exactly historically accurate, it’s a great story, an American story of a child’s imagination and American know-how. Brett Helquist’s bright, bold illustrations capture Milly’s whirlwind adventures in the store and the excitement of the parade coming to fruition. His ability to capture emotion is the slant of an eye or a smirk adds humor as well as visual interest. Ms. Corey’s tale and Mr. Helquist’s drawings come together like Milly and Mr. Macy to make a production as big and grand—and American—as the dazzling Thanksgiving Day Parade itself. Traction Man is here again! 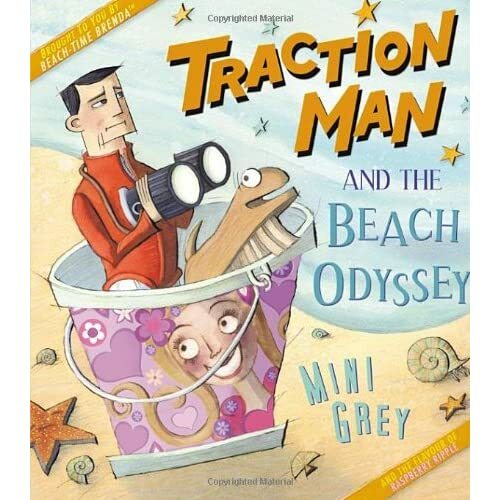 The star of Mini Grey’s previous books, Traction Man , and Traction Man Meets Turbo Dog, returns in an adventure that will take him to the beach–but not in the way that you might expect! While everyone else is having a quick dip in the water before lunch, Traction Man is kidnapped by Granny’s dog, and neither his faithful Scrubbing Brush nor his mighty panoply of equipment can prevent it! What will he do?? The granite-jawed Traction Man (obviously a toy, but so much more!) and noble, anthropomorphized Scrubbing Brush’s trip back to safety involves another dog, frighteningly-accessorized dollies, raspberry-ripple ice cream, and a large quantity of seaweed. As in all previous outings, Mini Grey’s hilarious illustrations and comic-style text boxes pack an astonishing amount of detail onto each page, while never distracting from the story. While a summer story, this book would be perfect for those going on a winter vacation to warmer climes, or just for someone who wants a little bit of warmth injected into their November. Larry is a polar bear. He remembers when he was a cub, dancing under the colored lights of the Arctic night sky with his mother and his brother, Roy. Now Larry lives in New Jersey with the Frobisher family in the Hotel Larry, named after himself (that’s another story). Larry often helps out; for example, he walks Mildred Frobisher to her dance lessons. One day he decides to go inside and see what the ballet lessons are all about, and is so moved that he dances along with Mildred and the other little girls. However, Madame Swoboda, the dance instructor, forbids Larry (or any other polar bears for that matter) from participating in ballet class again. So, Larry asks Mildred to show him and his polar bear friends how to dance ballet, and they all put on a show to remember. I enjoy Dancing Larry for its absurd humor, its bright and lively illustrations, and for the pleasure of meeting the ebullient and generous character of Larry the polar bear. 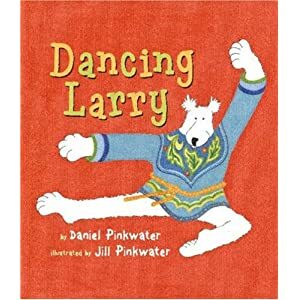 If you’re looking for something fun and offbeat, check out Dancing Larry and the other books in the Larry the Polar Bear series. Or, if joyful and bighearted polar bears don’t do it for you, try one of the Irving and Muktuk stories (Irving and Muktuk are also polar bear residents of New Jersey, but they are known to be “bad bears”). As for me, I’ll read about all the polar bears of New Jersey – the hotelier-rescuing-good and the blueberry-muffin-stealing-bad alike. 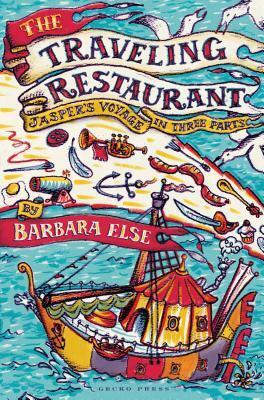 What is not to love about a book that features high seas adventures AND delicious meals? Climb aboard the Traveling Restaurant! The Traveling Restaurant takes place in a fantastical land that has lost the use of magic after a “great accident.” In fact, the main character, twelve year old Jasper and his baby sister Sabilla have never even seen magic. Ever since the “great accident”, Fontania has been ruled by the Provisional Monarch, Lady Gall, a vain woman that does not take criticism well. Lady Gaill is obsessed with her own beauty and popularity and keeps everyone in the kingdom on pins and needles with her extreme measures to keep order in the kingdom. Jasper finally has his fill of Lady Gall when he discovers that she tried to poison his baby sister Sabilla at an event. When he tells his parents, they decide it is time to tell Jasper the secrets of his family’s past, including why Lady Gall would be threatened by the one-year-old Sabilla. Jasper’s parents also decide it is time to flee the kingdom. Unfortunately, before Jasper learns very much, the family is separated and Jasper finds himself alone on the boat docks of Fontania. He finds his way to the Traveling Restaurant, a boat manned by the mostly silent Dr. Rocket and his gruff assistant Polly. As the restaurant sets off to reunite Jasper with his family, Jasper starts to notice some strange things about himself as well as Dr. Rocket, Polly and even the ship itself. He does not have very much time to dwell on it as they find themselves confronted by pirates, Lady Gall’s army and several natural (or maybe not so natural) disasters. Filled with action and adventure as well as a lot of heart, this rousing adventure would work really well as a family read aloud for kids in first, second and third grades. 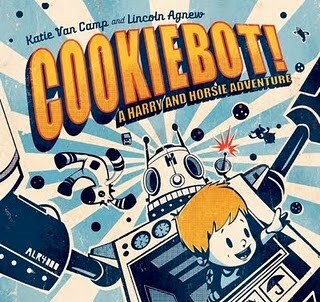 In the second installment of the Harry and Horsie books, the adventure-seeking duo is on a mission…a mission for cookies. Harry’s mother has perplexingly placed the cookie jar on top of the refrigerator where it is out of the reach of little Harry. How will Harry and Horsie ever satisfy their grumbling tummies? By building a robot to help them reach the cookie jar, of course! Disaster strikes, however, when their robot develops a sweet tooth of its own, and suddenly all of the cookies in the entire city are in jeopardy. Cookiebot! is an entertaining glimpse inside the mind of a child. Katie Van Camp does a great job of capturing the spirit of a little boy with a big imagination and his devotion to his favorite stuffed toy. Lincoln Agnew’s bold, retro-inspired illustrations convey an innocence and exuberance perfectly suited for the energetic story. The reader is easily transported into young Harry’s world where a refrigerator becomes a skyscraper, boxes and utensils become a giant robot, and a stuffed horse becomes a hero. Readers who fell in love with Harry and Horsie in their first adventure will surely enjoy this next installment as well. It’s always fun for me to see how an author will highlight all 26 letters in an alphabet book. I was not disappointed when reading ABC ZooBorns! It is a delightful alphabet book with adorable and, often, cuddly looking baby animals. Each page features a photo of a baby animal along with a simple statement describing the animal. The back of the book offers a glossary with additional information such as the species, home and conservation status of each animal. Don’t skip looking over the beginning words by Paul Boyle, PhD about learning how to protect animals. You might find yourself paging through this book over and over again – the photographs are just that much fun to look at!